It’s springtime, I can feel it! The sun is shining, the birds are chirping, the flowers are just beginning to bloom. 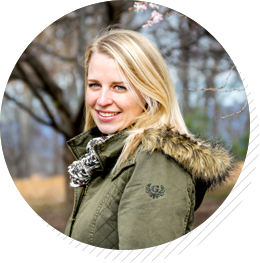 This time of year always gives me a little extra spring in my step, do you know what I mean? 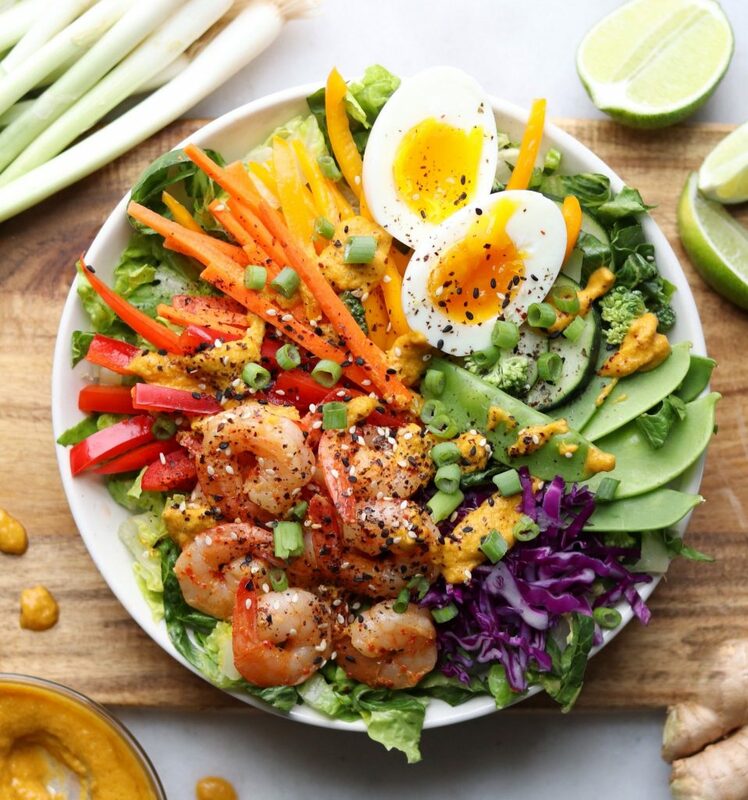 And it always has me craving brighter, lighter meals, like this Asian Ginger Rainbow Salad, topped with perfectly sautéed shrimp. It comes together in under 25 minutes total, so it’s quick to get on the table and into your belly. And guess what? It’s Whole30 compliant! Trust me, the low carb, Asian-inspired salad dressing is one of my favorite things to make, like, ever. Every time I make it, I’m tempted to lick the bowl afterward. 90% of the time, I don’t… but the other 10%? Insert tongue emoji here, wink. It’s basically a flavor-packed veggie smoothie, sweet, rich, lightly spicy and a little salty, and it’s made in the blender. If you follow this recipe, you should have plenty left over after dinner– I like to use it on roasted veggies, eggs, chicken, pretty much whatever I’m eating. Just be careful with the amount of coconut aminos you use, because the saltiness of coconut aminos varies from brand to brand — I’ve found that I need quite a bit less when I use Coconut Secret than when I use Trader Joe’s. Start with less, taste test, then add more if you need it. Want to know what people are saying about this recipe? And I really love all the crunch in this Asian-inspired salad. The fresh veggies are unbelievably flavorful, and they compliment each other perfectly. My preference with a salad like this is to use a crunchy romaine or even iceberg lettuce, because it’s holds up well to the heavy toppings and dressing. The main reason why shrimp is my go-to for easy Whole30 meals – they cook super quickly and are absolutely delicious! I usually make this dish by sautéing shrimp, but I’ve also made it with grilled shrimp too and it’s totally delicious. Just heat your grill to medium-hot and use a grill-safe pan or skewer the shrimp first. Remember that shrimp cooks very quickly, so you really only need to cook it for a few minutes total, regardless or whether you’re cooking on the stovetop or grill (make sure you turn them once). As soon as they’re pink and slightly opaque, you can remove them from the heat. In my experience, it never takes more than about 4 minutes. Nothing is faster than that! Okay, maybe opening a can of tuna is faster, but nothing cooked is faster. 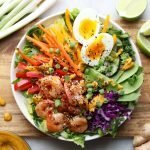 Are you planning to try this Rainbow Asian Ginger Salad with Shrimp? Let me know in the comments below or tag me on Instagram @cookathomemom! Rinse the shrimp & pat dry with paper towels. Mix the seasonings in a bowl, then add the shrimp. Toss to coat, then set aside. Over medium heat, melt the ghee in a skillet until hot and shimmering. Add the seasoned shrimp and cook, stirring occasionally and turning, until firm and pink, about 4-5 minutes. Shrimp are easy to overcook, so as soon they’re cooked through, remove them from the skillet. Roughly chop all the ginger dressing ingredients and add to a high powered blender or food processor. Double blend on high until smooth. 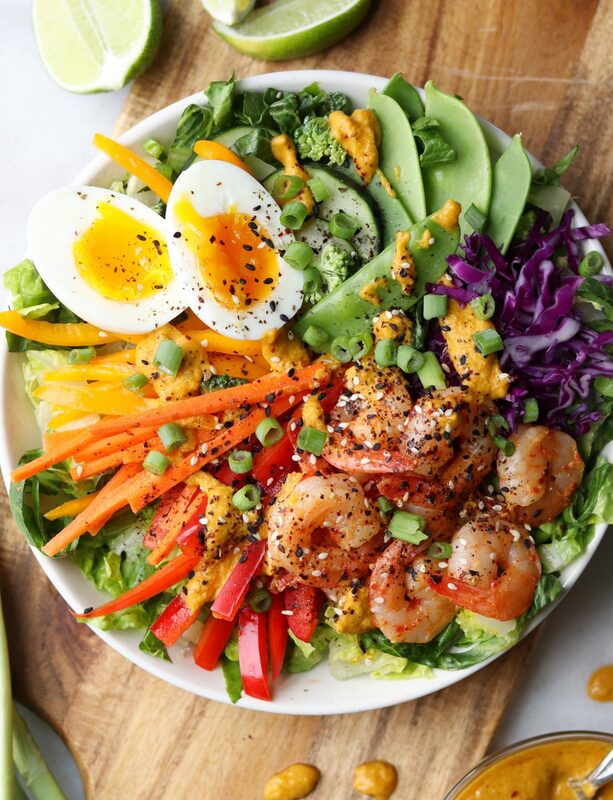 Once the shrimp and dressing are complete, assemble your salad bowl with desired toppings. Enjoy! 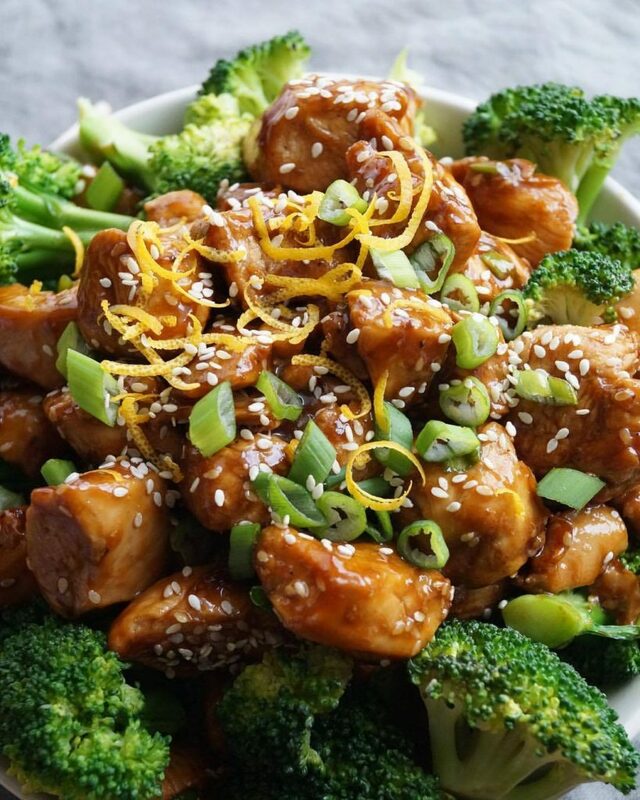 Be sure to check out my Orange Sesame Chicken & Broccoli recipe too!